The 1970s were the pinnacle of large American cars. Some may argue that large cars are alive and well today. They would be wrong. The massive shrinking of large cars which began in the late-1970s and continued through the 2010s has transformed large cars into tiny cars compared to their mid-1970s counterparts. As an example let’s look at one of the biggest rear-wheel drive cars currently produced in America, the 4-door 2016 Chrysler 300. It still can be equipped with an optional V8 just like the large cars of yesteryear. Its 199-inch length and 75-inch width by today’s standards is considered mammoth. But consider this, back in the fall of 1975, the Chrysler corporation released its all-new 1976 Dodge Aspen and 1976 Plymouth Volare. When compared to the other 1976 models found on the Dodge and Plymouth new car lots, they were tiny cars and Chrysler marketed them as such. The 4-door Aspen and Volare had a 201.2-inch length and a 73.3-inch width. The 2016 Chrysler 300’s length in comparison is 2.2 inches less and its width is 1.7 inches wider, so it’s a wash which one is bigger. In forty years what was considered a small car size is now consider a very large car. If you don’t remember the 1970s or haven’t seen any 1970s American cars lately, you would find it hard to believe that there were many cars from this era that were longer in length than a 2016 Chevrolet Suburban. It has a 224.4-inch length. The biggest of the bunch in the 1970s were luxury cars. After WWII it became a given that the most expensive American luxury cars were the biggest on the road. American automakers figured if buyers were paying lots of money for luxury cars, they should get more mass metal. Watch the old TV sitcoms, movies, and even cartoon shows from the 1950s through the 1970s and you’ll notice big luxury cars were used as a symbol of monetary wealth. This philosophy (but on a much smaller scale) still remains today, larger cars tend to cost more than smaller cars. Car buyers with bigger wallets tend to own bigger cars. If most luxury cars of the golden era were compared to large sea vessels, the 1973 Imperial would have been the Seawise Giant (oil tanker) – the largest ship ever built. This car is truly massive with Shaq like proportions – a 235.3-inch length, 79.6-inch width, and a 127-inch wheelbase. Not only was it the biggest the 1970s had to offer, but it was the largest post-WWII non-limousine car ever built. The curb weight was an astounding 5,000 lbs which was extremely heavy back then. If a car that size was produced in 2016 (since it would have to meet current federal crash impact standards along with having to be equipped with all the mandatory heavy items such as air bags and anti-lock brakes) it would weigh at least 7,000 lbs, maybe more. The other Imperials from the 1970s were also massive in size, but the 1973 Imperial beat them all by a few inches in length. The Imperial was the Chrysler Corporation’s most opulent luxury car during that time. Its reign would not last long, it’s life as a large luxury car ended at the completion of the 1975 model year. Starting in 1976, the Chrysler New Yorker Brougham would take over its sales niche. The 1973 Imperial even today is a blast to drive with its pillowy suspension which absorbs potholes and road imperfections. Speed bumps are no problems for this car. Hit a speed bump without slowing down and the response generally is “what speed bump?” The problem arises when parking the massive Imperial in a modern parking lot. With a length about a foot longer than a 2016 Chevrolet Suburban, good luck finding a parking spot where the Imperial fits. Why not take two spots? Nobody would blame you. The 1973 Imperial may have been big, but it was a true beauty. The long curved elegant lines were sculpted by some of the best designers during the golden era of Chrysler. It may not have had as much ornate exterior dressing as the 1950s and 1960s Imperials, but it still had enough chrome exterior trim to prove it was a top tier luxury car. The hidden headlamps surrounded by a large full bumper length expansive grille gave the Imperial a sporty and modern look in its day. 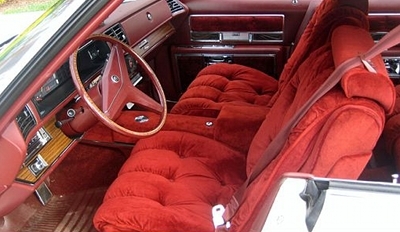 The standard luxury trim version of the 1973 Imperial was the Crown with the more upscale LeBaron trim model being optional. And if 4-doors wasn’t a particular 1973 Imperial buyer’s cup of tea, a 2-door was available (which had the same massive proportions as the 4-door Imperial). The Imperial Crown and LeBaron were both standard with Chrysler’s big-block 440 CID V8. It produced 215 net horsepower and 345 lb-ft of torque. The compression ratio drop for the 1972 model year in order to accommodate the new federal unleaded fuel mandate had robbed some horsepower and torque from the 440 V8. To add insult to injury, 1972 was also the first year for the more stringent “net” horsepower rating system which pushed horsepower and torque figures even lower. The 345 lb-ft of torque that was available very low on the rpm range, provided the big Imperial with plenty of pulling power around town. If you are looking to add to your car collection the biggest post WWII American land barge, the 1973 Imperial is it. Back in the day you had to be a doctor, high-level corporate executive, or small business owner to afford one. Currently a mint condition 1973 Imperial is within reach form most, with some of the best examples costing no more than $11,000. There was no greater barometer for success from the 1950s to 1980s, than owning a Cadillac. Many worked hard to climb the corporate ladder, toil away in their own businesses, or master their professions to obtain this goal. Sometimes it meant long hours, missed vacations, and keeping a tight reign on their personal budgets for many years. The goal was simple – the eventual purchase of a new Cadillac. It was a big goal shared by a diverse group made up of corporate executives, small business owners, doctors, and even Mary Kay cosmetic sales reps. The 1974-1976 Cadillac Fleetwood Brougham was the largest post-WWII Cadillac (excluding any Cadillac limousine versions) ever produced. The first all new post-WWII Caddy was the 1948 Cadillac, a reasonable sized large vehicle with a length of 214 inches. By 1974 with the Cadillac Fleetwood Brougham total length had grown to what seemed to be as long as the Golden Gate Bridge. During the post-WWII era, only the 1973 Imperial (which was only 1.6 inches longer than the Fleetwood Brougham) was bigger. The 1974-1976 Cadillac Fleetwood Brougham was the apex of Cadillac’s “bigger is better” era, with a length of 233.7 inches, a width of 79.8 inches, and a wheelbase of 133 inches. It was .2 inches wider and its wheelbase was 6-inches longer than the 1973 Imperial. This gave the Fleetwood bigger interior space than the Imperial. Though the Imperial could be equipped with many luxury options, the Fleetwood Brougham was the top luxury banana. There was a reason why Cadillac was the luxury car standard of the world during this era. If you opted for the d-Elegance or the Talisman trim package, a gorgeous pillowy velour interior was included which even today puts to shame the furniture in the world’s finest luxury hotels. The 1974 Fleetwood Brougham had the largest displacement standard engine of its era, a 472 CID V8 which produced 205 (net) horsepower and 380 lb-ft of torque. For 1975 and 1976 an even bigger 500 CID V8 replaced the 472 V8. For those unfamiliar with cubic inches, that equates to 8.2 liters of displacement. Today anything approaching or surpassing 5.0 liters is considered mountains of displacement, just the mere thought of an 8.2 liter V8 today is unfathomable. It’s safe to predict that a 8.2 liter V8 will probably never be available on a new car option list ever again. Even the 472 V8’s 7.7 liters was considered over-the-top to many. GM’s other divisions’ largest V8s were 7.4 or 7.5 liters. Chrysler’s largest was 7.2 liters while Ford’s largest was 7.6 liters. The logic was simple, Cadillac wanted to provide the biggest and the best, and a smooth 500 CID V8 easily gave Cadillac the honors. The 500 CID V8 was first introduced in the 1970 Cadillac Eldorado where it produced 400 (gross) horsepower and a whopping 550 lb-ft of torque. By 1975, the 500’s output had dropped to 210 (net) horsepower and 380 lb-ft of torque. The torque was available very low on the rpm range, allowing the 500 V8 to effortlessly move the big Fleetwood. For 1976 the 500’s horsepower dropped to 190 and torque was slightly down to 360 lb-ft. Fortunately Cadillac for the 1976 Fleetwood added an electronic fuel injection option to the 500 CID V8 which increased horsepower to 215 and torque to 400 lb-ft. By 1976 standards, 400 lb-ft of torque was phenomenal. It was more than enough torque to easily pull the 5,746-lb Fleetwood Brougham around town with ease. GM threw in the towel on ultra large cars before Chrysler and Ford did. 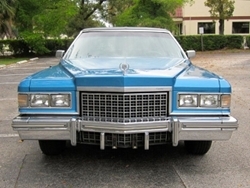 This affected Cadillac, for 1977 the Fleetwood lost a full foot in length and wheelbase. Even though the 1977 Fleetwood Brougham was still large, it was like a mid-sized car in comparison to the 1974-1976 Fleetwood Brougham. It’s a safe prediction that never again will Cadillac ever build cars as big as the 1974-1976 Fleetwood Brougham. Cadillac will soon release a new full-size rear-wheel Cadillac for 2017 called the CT6. It may be very big by today’s standards but with a length of 204 inches, it’s almost 3 feet shorter than the 1974-1976 Fleetwood Brougham. Buick in recent years has had a difficult time finding its footing. Let’s face it, Buick would have bit the dust when Pontiac and Hummer did if it had not been for strong sales in China. 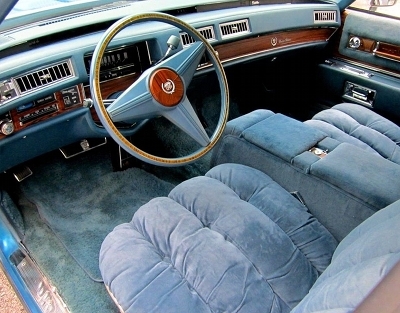 Back in the 1970s Buick’s mission and purpose were crystal clear. It was the brand in GM’s pecking order right below Cadillac. If you wanted 90-95% of what a Cadillac could offer in terms of luxury for a more affordable price, Buick was the GM division where you shopped. The Buick Electra by the 1970s had become a luxury barge. It was standard with a lot of luxury features and had a laundry list of luxury options that brought the Electra within an hair of Cadillac’s ultra-luxurious Fleetwood Brougham. By 1975 the Electra was less than an inch shorter than the Fleetwood Brougham – .3 inches to be exact. In other words such, a miniscule difference that even when the Electra and Fleetwood were lined-up next to each other, the human eye couldn’t tell which one was bigger. When reflecting on the length of the Electra, it’s actually quite a feat when you consider the 1974-1976 Fleetwood Brougham had a 133-inch wheelbase and the 1975-1976 Electra had a 127-inch wheelbase. What this meant was the Electra had a longer rear trunk area than the Fleetwood Brougham, the same was true with the 1973 Imperial since it also had a 127-inch wheelbase. The Electra had the 1973 Imperial and 1974-1976 Fleetwood beat in one measurement area. The 1975-1976 Electra had a width of 79.9 inches besting both the Imperial and Fleetwood. The 1975 Electra had a length of 233.4 inches while the 1976 had a length of 233.3 inches. The difference couldn’t even be detected when both Electras were side-by-side. Since the 1975 is .1 inches longer than the 1976, it has the title of being the biggest Buick ever built. Just in the case of the Fleetwood Brougham, GM’s rush to downsize the full-size (C-body) platform in 1977 also shrunk the big Electra’s length by about 1 foot. Unlike the rear-wheel drive Fleetwood Brougham (which would stick around in the 1980s and in the 1990s would be called just “Fleetwood”) that remained a fairly large car, the poor Electra would be shrunk down to almost ridiculous proportions in 1985. For 1985 the Electra converted to front-wheel drive and had a 197-inch length. It was 3 feet shorter than the 1975-1976 Electra. It was this shrunken Electra that would eventually send loyal Buick customers to other luxury makes. The 1975-1976 Electra came standard with the “225” trim package. Next up the luxury ladder was the “Limited”. For those wanting the best luxury Buick had to offer there was the “Park Avenue” trim option. Late-model Buick cars are several luxury notches below the current Cadillac offerings. Back in the mid-1970s this wasn’t the case as mentioned earlier. The 1975-1976 Electra was as elegant as the top-tear Cadillac and offered nearly every option the Fleetwood Brougham had. In fact if you ordered the Park Avenue trim package it gave the Electra an interior just as luxurious and upscale as the Fleetwood Brougham. Indeed with the 1975-1976 Electra, Buick had finally arrived as a true luxury car contender. The 1975-1976 Electra was offered in a 2-door in all luxury trim levels (225, Limited, and Park Avenue). It had the same massive measurements as the 4-door Electra. Cadillac didn’t offer a 2-door version of its 1974-1976 Fleetwood Brougham. Standard under the hood of the 1975-1976 Buick Electra was Buick’s big-block 455 CID V8 rated at 205 horsepower and 345 lb-ft of torque. For the 1976 Electra, Buick did offer as a rebate/delete option a 20% more fuel efficient motor – the Buick small-block 350 CID V8 rated at 155 horsepower and 280 lb-ft of torque. Though the 1976 Electra was lighter than the 1974-1976 Fleetwood Brougham, it was still weighed a hefty 5,000 lbs. The 350 V8 was not well-suited for that job. The 455 on the other hand had plenty of low end torque and enough horsepower to move the big Buick with ease. The Buick 455 was laid to rest when production of the 1976 Electra ended. This was a harbinger of the end of Buick’s nipping at Cadillac’s heels in the luxury market. Never again would Buick reach the pinnacle of going toe-to-toe with the mighty Cadillac in the luxury arena. With Buick being lost in the wildernesses of mediocrity for the last 3 decades, it’s safe to predict that Buick will never produce a massive ultra-luxury Electra type car again. How sad, how very sad!